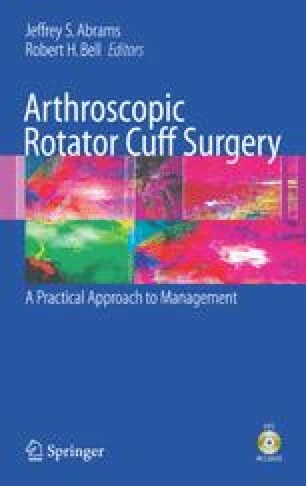 Arthroscopic rotator cuff repair, once the domain of a select group of surgeons, is quickly becoming the standard of care employed by more and more orthopedists. This transformation is due in great part to the advent of improved anchors, stronger suture material, and enhanced suture passing devices, resulting in enhanced success rates.1, 2, 3, 4 However, the most significant advances have come about due to constant improvement in our teaching of new techniques. What was once an operation done by few is now one that even the general orthopedist might well consider for his or her occasional rotator cuff repair. This chapter is directed to those individuals far enough along on the learning curve to be comfortable with an all-arthroscopic repair and ready to tackle some of the small and medium tears they may encounter during routine decompressions. Other chapters will deal with more advanced techniques such as mobilization and interval releases; this chapter describes my technique for the simple, mobile, small and medium tears from room setup to suture passing, knot tying to rehabilitation. After all, these are not only the lesions best suited for a surgeon’s first all-arthroscopic repairs but also are the most common tears the average orthopedist will encounter.